35 star American national flag, in an unusual, small size, with great graphics and nice family history; likely produced by an identified maker. The stars of the flag are arranged in what is known as a medallion configuration. This particular variety has been called a double-wreath, due to its two concentric rings of stars. As with most medallions, there is a flanking star in each corner of the Navy blue canton, accompanied by a star in the very center of the inner ring. Many medallion pattern flags have a large star in the very center, but here there is a small star, instead, which is the same size as the remaining 34. 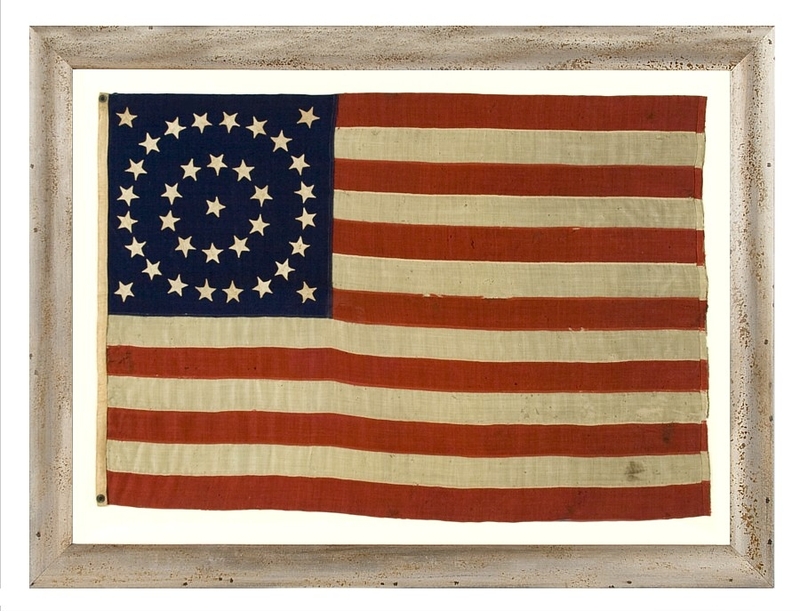 The flag has reportedly remained in the possession of the same family since the time it was official (1863-65), during the Civil War. It was acquired from the great-granddaughter of a physician by the name of Charles F. McEwen*, who was married in Maryland and was either a Pennsylvania or a Maryland resident when the war occurred. These facts are interesting because the flag appears to be linked to a Baltimore sail and flag-maker by the name of Jabez W. Loane. 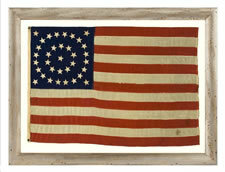 Seldom do we know who made any given flag during the 19th century. Few makers marked their flags and few photos can tie a flag to a particular manufacturer. But this particular flag, unlike most others, has a couple of clues that aid in its identification. 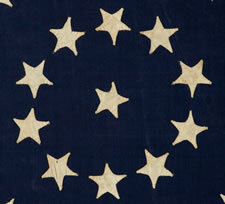 Flag expert and Civil War museum curator, Howard Madaus, had extensive records on Civil War period flags. Drawing on his research across known examples, he attributed a flag, illustrated on page 73 of “The American Flag: Two Centuries of Conflict and Conduct” (Madaus & Smith, 1996), to Loane. The flag in the Madaus/Smith illustration is effectively the same as the flag in question here. It employs the same number of stars in each wreath, arranged in the same fashion, all with a single point facing inward. The binding on the hoist of the flag in the Madaus/Smith book is unusually narrow, with two brass grommets, one at the top and one at the bottom. The flag in question here is the same. The hem of both flags at the fly end appears to be approximately the same width and both are turned toward the obverse (front) of the flag. Even more interesting, however, is the presence of a length hemp rope on the example in question, which is sewn within the extreme end of the binding. I have seen rope before, sewn on the fly, but it is very unusual and I don’t recall ever seeing it sewn into the hem. The flag in the Madaus/Smith book appears to have a piece of rope protruding from the hem on the last white stripe. While the two flags are different in length, at 57.5 inches for the flag in question versus 67.5 inches for the Madaus/Smith flag), the height of each flag is the same at 40 inches. 3 feet 4 inches is an odd measurement and, based on the facts already outlined above, is probably no cooincidence. West Virginia entered the Union as the 35th state on June 20th, 1863, and this flag was used during the closing years of the Civil War. 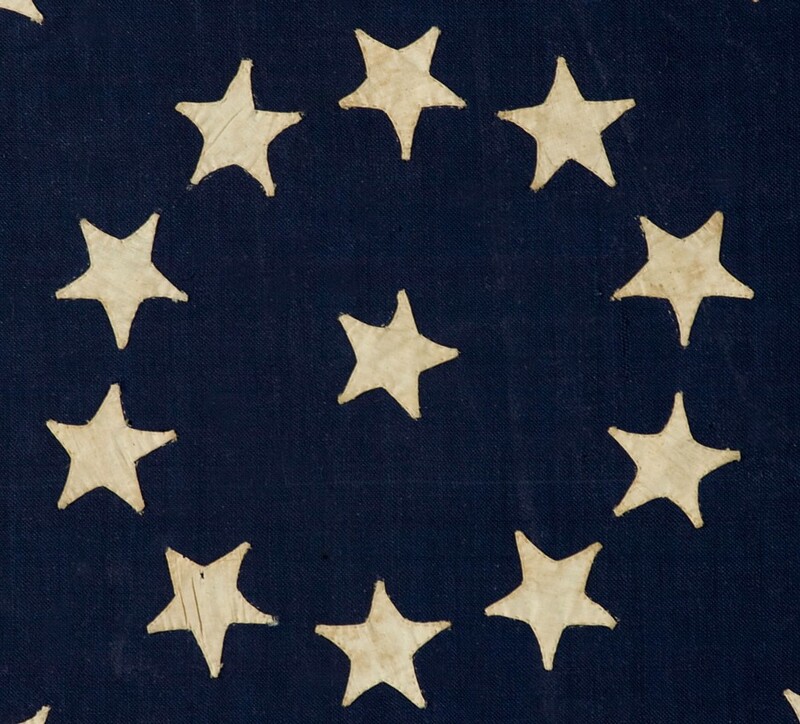 Although 35 was the official star count until July 4th, 1865, most flag making that was not under military contract would have included a 36th star after the addition of Nevada on October 31st, 1864. This means that 35 star flags were realistically produced for less than a year and a half. Construction: The stars of the flag are made of cotton and double-appliquéd (applied to both sides of the Navy blue canton). The canton and stripes of the flag are made of wool bunting that has been pieced with treadle stitching. The hoist is made of heavy cotton and applied with chain-style treadle stitching. 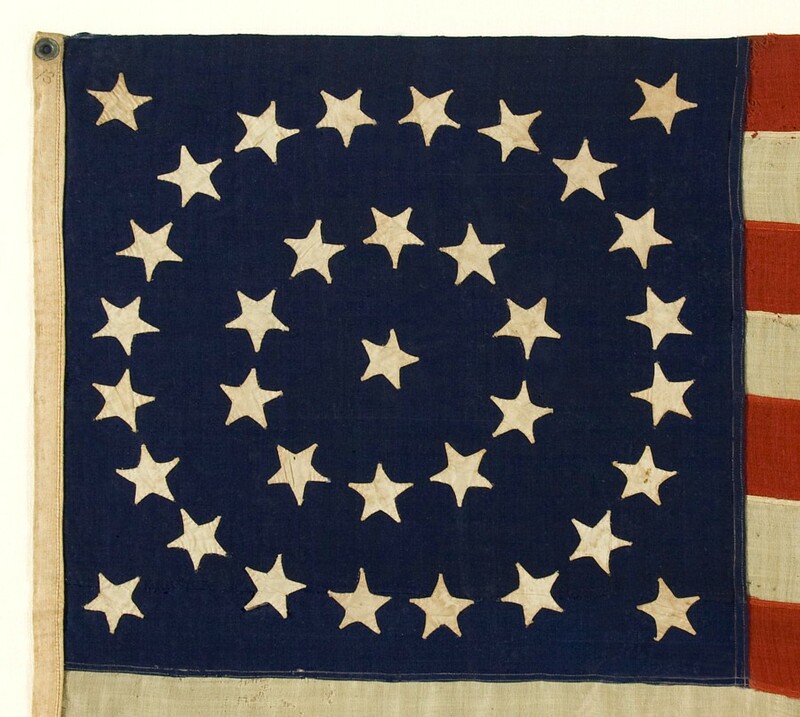 This type of stitch saw very short-term use on flags made during the second half of the war, which is consistent with the star count. There are two brass grommets, one each at the top and bottom of the hoist. The number “13” is penciled at the top of the hoist, just under the grommet, but the meaning of the number is unknown. Mounting: The flag has been hand-stitched to 100% natural fabrics for support on every seam and throughout the star field. It was then hand-sewn to 100% hemp fabric, laid over a supportive panel. The mount was then placed in a hand-gilded and distressed Italian molding with a wide, convex profile. The front is U.V. protective acrylic. Condition: There are various minor losses and tears throughout. 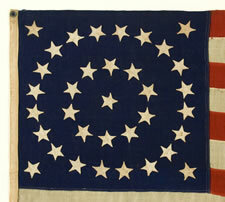 Fabrics of similar coloration were placed behind the flag for masking purposes. There is minor foxing and staining, the darkest of which are two spots in the bottom fly-end corner. * The records of Civil War soldiers can be difficult to obtain. The granddaughter of McEwen knew that the spelling of the family name (her maiden name), had definitely changed at some point in the past. Because Maryland was a slave state, Charles F. McEwen may likely have served in Pennsylvania. Two men by this name served the Union Army in Pennsylvania, one of which mustered into the 14th PA Cavalry at Pittsburgh, was captured at Fredericksburg, and died at Andersonville Prison. The other mustered into the 192nd Pennsylvania at Philadelphia and survived the war. Neither man listed a residence, which was not at all unusual. McEwen may have become a physician following the war or may have served in that capacity during wartime. This and other information has been lost, but research is under way to uncover what exists at the National Archives. **Information on Jabez Loane obtained from: Bazelon & McGuinn, “Military Goods Dealers and Makers, 1785-1915” (1999, Bazelon & McGuinn), p. 166. Measurements flag: 40" x 57.75", frame: 52.75" x 70.5"